Over 70 years ago, in the General Motors-sponsored Futurama exhibit at the 1939 New York World’s Fair, an estimated 10 percent of all Americans were transported across a landscape of innovation, creativity, and optimism that became the economic and cultural foundation of the great American century. The Futurama exhibit was a huge diorama of a highway-heavy, congestion-free, car-dependent, time-efficient, leafy green urban and suburban all American pattern of civilization that no one had ever seen before. 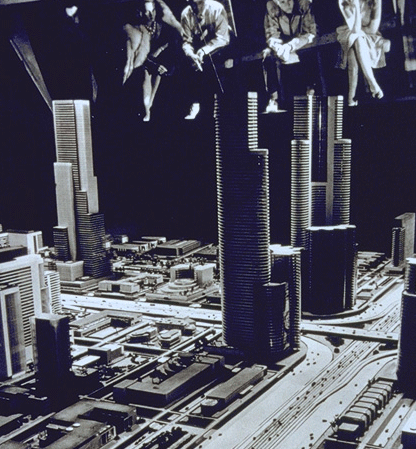 What astute observers recognized — among them Lewis Mumford and Walter Lippman — was that GM’s new American geography needed enormous public investments in the roads, sewers, education, research, planning, and industrial infrastructure to make it reality. The vision, though, of an airy, prosperous, shining, and mobile American way of life was powerful and eminently achievable. Over the next two decades voters elected to Congress and the White House lawmakers of both parties who cooperated in steadily enacting big and expensive bills — the GI bill to educate veterans, the 1956 Highway Act to start the Interstate System, water and sewer spending bills, research grants for engineering, just to name a few — to change the way America looked and functioned. Last week, Senators John Kerry of Massachusetts and Joe Lieberman of Connecticut introduced The American Power Act, a big and expensive spending bill that is in every way a response to that incredibly accurate 70-year-old GM vision. Its central goal is to preserve American choice and mobility — the two central features of our way of life — in the face of an oncoming train wreck of accumulating economic and environmental consequences. Kerry and Lieberman propose to execute this impossible task by laying out two paths for legislative action that need to be achieved simultaneously. The first is to generate more supplies of conventional energy sources — oil, coal, and nuclear — in order to stave off the slow demise or even the collapse of America’s convenient, have it your way, drive through economy. The proposal provides incentives to coastal states to pursue more offshore oil and gas development, while also giving neighboring states the power to block development within 75 miles of their shoreline. It includes $2 billion-a-year in research grants to coal-burning utilities to test carbon capture and sequestration. It proposes to invest tens of billions in loan guarantees and other support to encourage the construction of 12 new nuclear plants. The second tactical step in the legislation is to push America as insistently as politically practical toward more energy-efficient transportation, and home-grown, renewable, and much cleaner sources of energy. The idea is to spur innovation, new patterns of compact development, and new industrialization that also generates much less carbon pollution. Kerry and Lieberman proposed spending $70 billion over 10 years on transit, clean vehicles, energy efficiency and other Smart Growth innovations. They lay out a plan for farmers to gain income by siting renewable projects on their land and to grow biofuels. There is money for solar and wind development. And the bill contains provisions to reduce carbon emissions 17 percent below 2005 levels by 2020, and over 80 percent by 2050. The bill envisions putting a price on carbon, and providing for trading carbon allowances that applies to large polluters and could generate billions of dollars annually, a portion of which would be rebated to citizens. As a study in pragmatism, the American Power Act does pretty well. The legislation addresses most of what’s possible and practical in the place where energy, economy, the environment, and politics now meet. It’s as big and bold as it dares in an era when the boom-boom-boom of dire risks to our way of life — climate change, declining competitiveness, rising energy costs — is greeted in political circles with the squeak of small ideas and the clanging of ideological idiocy and anger from every side. In almost every instance, environmental organizations and business groups commended Kerry and Lieberman for such a solid first draft. And in almost every instance — the exception was the Smart Growth community’s enthusiasm for the $7 billion-a-year investment in transit, clean car, and other transportation and efficiency measures — groups said the intricacies of the bill needed serious reworking. Environmental groups are not thrilled with the oil, coal, and nuclear provisions. They aren’t thrilled with a section that would withdraw some authority of the EPA to regulate carbon emissions from certain sources. And climate groups are concerned that the bill’s proposal to start in 2019 to dedicate some of the revenue from carbon allowance trading to helping developing nations make the transition to a low-carbon economy is too little and too late. Many business executives, meanwhile, are nervous about the carbon emissions limits. Democratic lawmakers from the Midwest want more investment in clean tech manufacturing. And the bill’s former sponsor, South Carolina Republican Lindsey Graham who dropped out following an ideological fit, said the proposal would not survive the — so far — uniform Republican opposition. America, of course, has not always had such trouble responding to change and transition. The America that resulted from executing the Futurama vision was industrious, optimistic, and capable of reacting to favorable market trends. The suburbs and highways, cul-de-sacs and three-car garages, homes with more bathrooms than TVs were made possible by cheap energy (most of which we generated ourselves), cheap land, core competitiveness in major industries, reasoned population increases, growing personal income, wealthy governments, and a willingness of taxpayers to invest in the nation’s future. We’re not dealing well with the new market trends of the 21st century. Energy prices are steadily rising. Land is expensive. Whole industries have moved beyond our borders. The U.S. is the third fastest growing industrialized nation in the world. Incomes are declining. Governments operate with enormous deficits. Taxpayers are unwilling to invest in a collaborative future. The result is a nation that is uncharacteristically hesitant and operating in fear. And while ideologues on all sides shout past each other, and make holding office at any level a thankless and grueling experience, the real danger in our governing circles is the entrenchment of the politics of stasis. Doing nothing. Holding the line. Not deciding. Not acting. The American Power Act contains a suite of reasoned ideas that make sense. Hopefully it not only survives the blizzard of amendments but is strengthened. The sole provision that could be considered a breakthrough, and needs to survive intact, is the bid to put a price on carbon and then to generate revenue by trading allowances. By itself that provision sets the basic foundation to reduce emissions, spur clean energy investment, and prove to the world that the United States is serious about being a leader in the global work to solve climate change. Taking into account the political and economic context, the bill’s passage would be a step, arguably a big step, for America’s future.